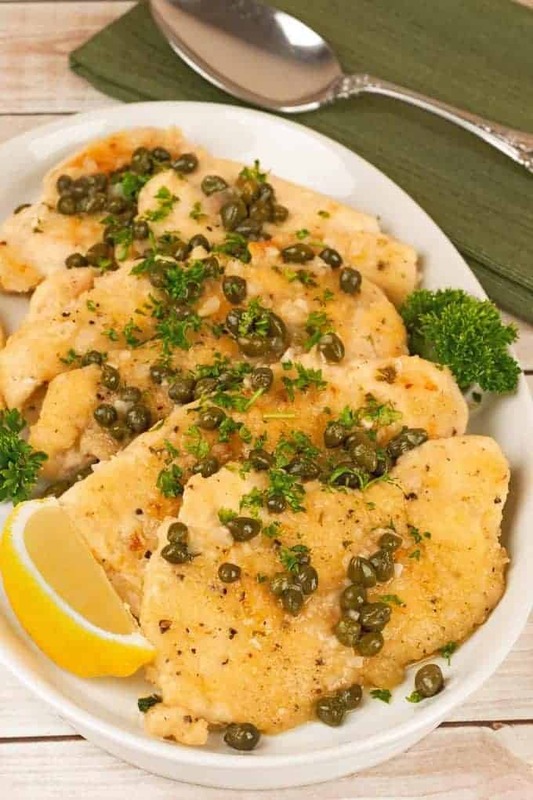 Chicken Piccata is one of those classic dishes everyone should know how to prepare. 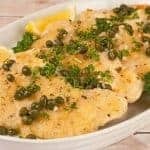 Made with thin pieces of boneless chicken bathed in a richly-flavored pan sauce of garlic, shallots, white wine, lemon and a handful of capers, it’s elegant enough to serve for company and quick enough for a weeknight dinner. For a well-rounded meal, serve it with a side of garlic mashed potatoes and a simple green vegetable like sautéed spinach or roasted green beans. 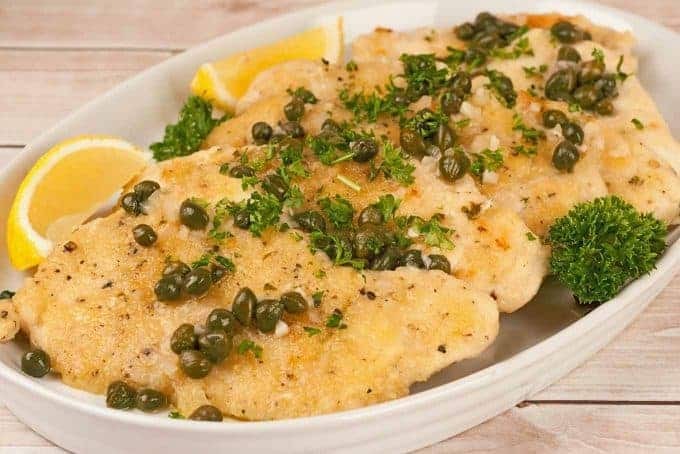 A classic dish made with thin slices of boneless chicken topped with a flavorful pan sauce made with white wine, garlic, shallots, lemon, capers and parsley. Place the chicken breasts between two sheets of plastic wrap and gently pound them to an even thickness of 1/4-inch. Then, depending on the size of the breasts, cut each one crosswise into 2 or 3 smaller pieces. Spread the flour on a sheet of wax paper, season liberally with salt and pepper and combine well. Dredge the chicken pieces in the flour mixture and shake off the excess. Heat 2 tablespoons of the olive oil in a large skillet over medium-high heat. 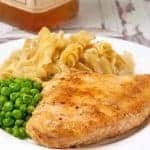 Working in batches to avoid overcrowding the pan, add the chicken in a single layer and cook until light golden in color and cooked through, 1-1/2 to 2 minutes per side. Transfer to a serving platter and set aside. 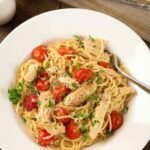 If needed, add the remaining tablespoon of olive oil to the pan and reduce the heat to medium. Add the shallot and cook until soft and translucent, 3 to 4 minutes. 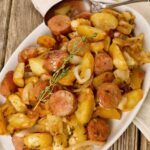 Add the garlic, cook for 1 minute additional, then deglaze the pan with 1/4 cup of the wine, scraping up any browned bits that may have accumulated on the bottom. 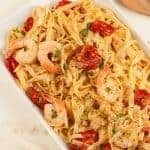 Stir in the remaining wine along with the lemon juice and cook, stirring often, for 2 to 3 minutes. 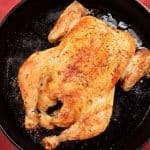 Return the chicken to the pan, turn the pieces once or twice to coat them lightly with sauce, then quickly transfer them back to the serving platter. Add the capers to the remaining sauce and cook until slightly thickened, about 1 minute additional. Spoon the sauce over the chicken and garnish with fresh parsley and lemon wedges. Serve immediately. 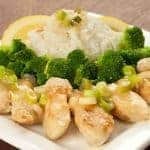 You can also use chicken tenderloins for this recipe. Simply remove any white tendons from the tenderloins, place them between 2 sheets of plastic wrap and pound very gently to flatten. 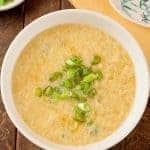 Proceed with the balance of the recipe as written.